Jesus The Radical Pastor: Denzel in "Deja Vu"
Julie and I are impressed with Denzel Washington's ability to portray believable characters. In Deja Vu, acting as ATF investigator, Doug Carlin, Washington takes us into a tense and thrilling mixture of modern day terrorism and wild science fiction. After an horrific terrorist bombing of a ferry in New Orleans, ATF agent Carlin gets involved in an experimental FBI surveillance unit, one that uses spacefolding technology to directly look back a little over four days into the past. Carlin is transported back in time to prevent the ferry bombing and to save the life of Claire Kuchever played by Paula Patton. One reviewer commented about Deja Vu: "A good script really helps a film and some lines of dialogue are truly excellent, intertwining science with religion whilst asking poignant, thought-provoking questions." Sometimes I read theological ponderings about whether God is outside time or inside time or both. Films like Deja Vu present the intriguing complexities of such questions. I was talking with a young couple recently and the guy had on a t-shirt that read "time is an invention." Watching Deja Vu, I think the t-shirt slogan is on to something. As I watched the film and wrestled with the "religion" issues, I thought about: what does God know, when does God know it, is he outside looking in as the FBI experimental unit "looks in" on Claire's life four days ago, or does he get involved in Claire's life as agent Carlin does? 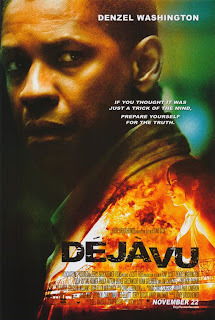 Films like Deja Vu, in my opinion, shock classical deterministic theism. I like the idea of the God revealed in the Bible who mixes it up with us; who sees, listens to, and joins us in this reality called life. We're not living out some cosmic program, each of us being meticulously decreed to act, feel, think and decide as the program has pre-decided. What kind of sovereignty is that? None, in my book. It's a program. If everything is eternally decreed by God (as classical determinism insists), then all talk about authentic human freedom in the end is just smoke and mirrors. I think relational theism is way ahead of the old-line linear decree of God view. In the divine-human relationship, God gets bumped and bruised (and crucified) as he enters our space and time to rescue us. He invites us into the story, not just as programmed widgets, but as authentic collaborators to make the story happen. Theology Proper begins at the cross of Jesus Christ and works out from there. One final word, I do not build my theology off of Hollywood movies. I was trained in classical deterministic theism and realized one day that Calvinists are that in theology (theory) only. In every day life, they are as Arminian as most. Relational theism works from Jesus' cross out and takes the Bible's presentation of a highly interactive God mixing it up with humans very seriously. Relational theists see no need to read as "anthropomorphisms" straight-forward statements about God found in the Bible. "Open theism" like "emergent/ emerging" are loaded terms. I like the phrase 'relational theism' because it speaks to the reality of the Trinity as Persons and how God-Three-in-One relates actually, authentically with humans beings in both creating and fulfilling his good and eternal purposes. Have you read Greg Boyd's *God at War: The Bible and Spiritual Conflict*? It's great. I like the idea of God who is in a liberating relationship with creation. God constantly seeks to set us free, while at the same time asking us to participate in this process. Sadly we sometimes are part of the destruction rather than being in the vanguard of freedom. I appreciate your comments. That God invites to participate with him as "co-workers" is staggering. Excellent and thought provoking. A film that helps shock classical deterministic theism has got to be worthwhile. Relational theism is helpful. Thanks for framing it this way. I've used "community" _ God is community and invites us into and then to live out of this community. On theology proper. I have tended to start from creation as the context for the cross. What do you think? I like the concept of the Godhead as a loving community. I think forming a theology proper by contemplating the cross in the context of creation is a fascinating approach. Hey John-I just watched this movie over the weekend. Thanks for stopping by JESUS THE RADICAL PASTOR. I enjoyed meeting you at the meeting. What a great "pilot" venture. I've made it to Mi. I'd love to get together for some coffee. I can't find your email. You can email me through my webpage. Welcome to G.R. I'll email you. I liked the movie, but the more I thought about it, it kinda falls apart.